The truth was that I was just forgetful and they had a tendency to become untied. So, I was thinking of that when I drew this set of Poppet paper doll clothing. I was also thinking about gender neutral children’s clothing which seems to be a trend. 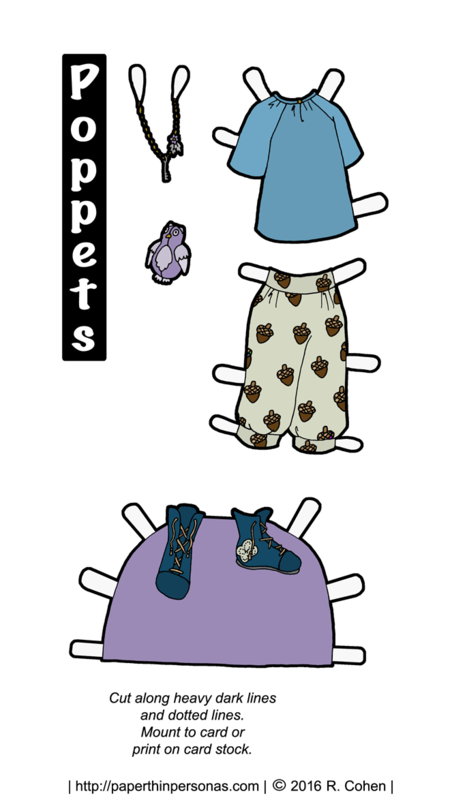 I think the pants could be worn by a boy or a girl, though all the Poppets are girl paper dolls. They are based off this pattern from Twig and Tale. I wanted to stick with the nature theme, so her pants have acorns on them and she has a stuffed owl. I don’t know why I’ve been on such a stuffed animal drawing kick. I did a bunny last time and an owl this time. I guess I just like drawing stuffed animals and that is probably okay. Her owl is purple. After this, the next two Poppet pieces in progress are both historical. I have a bunch of 1920s stuff in the works for them and some Edwardian looks too. I think today’s outfit would go well with last week’s explorer outfit and this one from 2014. As usual, if you love the blog, then think about supporting it on Patreon and I always love to hear what you think in the comments. i feel as though i need a purple owl thingie immediately. i ability to recognize “gender neutral” is severely impaired. it’s amazing to be confronted by ones own old-fashionedness. perhaps too many years studying the victorians–who had their own ideas about gender neutral, which was to put everyone in a dress and curls until they came of age ~ ha! Oh yeah, I regularly have to explain to people that the photo of their Great-Grandfather where he’s wearing a dress is really him. It’s just 1910 and everyone wore skirts until they were breeched. Seriously. Get over it. As the mother of young boys, I think about gender-neutral in a way I never did as a girl. I find gender-neutral is much more acceptable for girls than it is for boys. It’s easier for a girl. In fact, we empower and encourage girls to cross gender lines in a way we don’t for boys. In our house, we refuse to use gender terms for toys, tv, books, etc. A doll isn’t a girl’s toy anymore than a truck is a boy’s toy. Personally, I like this trend of fluidity on both sides of the aisle. It’s good for everyone. Oh yeah, and I love the acorn pattern. Very appropriate for November! I very much agree that girls are encouraged much more gender neutral than boys. I think part of this comes from the fact that it is perfectly acceptable for me to show up to work in a pants suit, but would be pretty odd for one of my male coworkers to show up in a skirt suit. We still associate men much more with specific styles of dress than we do women. i know kilts are a different sort of animal, but i had a friend who wore them all the time: utility kilt, dress kilt, casual, etc., and it was interesting how completely normal it was. no one batted an eye. wonder if anyone would have thought twice if he’d had poodles on his pleats.